You are currently browsing the category archive for the ‘Spot Check’ category. A revelatory trip to Ensenada last November brought me closest to some of my favorite food experiences in recent memory. Filled with fish tacos, tostadas and ceviche (of too many varieties), that were not only bountiful, but incredibly fresh (oh yeah, and wildly affordable!). In addition to sight-seeing at La Bufadora and doing as much touristy stuff we could pack into three days, our Baja visit was too short. Vowing to return soon, it isn’t always feasible to drive down three and a half hours, despite the perk of tracing the beautiful California coastline, so when I have an urge for some new-found favorites there are a few go-to’s in Los Angeles that can put me into that delighted state—one being Jesse’s Camarone’s—my eatery of the month. In an eighty-five-seat restaurant off West Adams Blvd, nearest USC, with red vinyl booths and a couple TVs piping in telenovelas and deportes (depending on the time and day), there lies an unassuming seafood joint that turns out delicious fish tacos and the best damn aguachile I’ve had yet. While better fish tacos might be had elsewhere (arguable, but that isn’t where I will hang my hat), I’ve searched for far and wide for aguachile—a shrimp and serrano pepper ceviche in simple terms—everywhere and Jesse’s has perfected it. 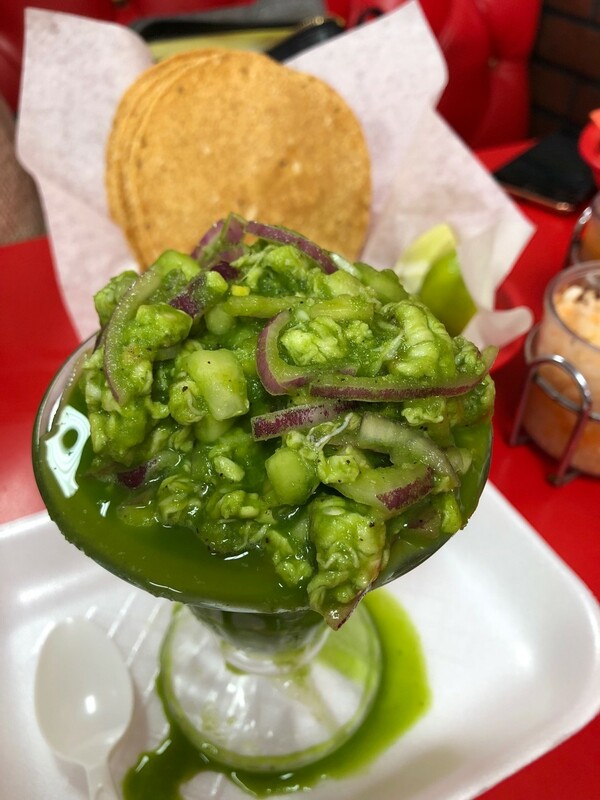 Served in parfait glass, overflowing with a deep green of cilantro, raw red onions and shrimp that is accompanied by a basket of tostadas, soda crackers and halved limes. I will not make the claim for authenticity, a tricky subject that is better left to a food historian’s thesis, but I will say that there few things, for my money (around five dollars), as perfect as this. I have had many other takes including refined and dressed up versions, where shrimp is forgone for bay scallops, or the sauce is concentrated, but those constantly seem to underwhelm. There is something to that dripping broth and intense spice of undiluted proportions that leaves me wanting more. A lot more! The best part is that it is fresh and light, so while your taste buds will be nearly spiced-out, there is still room for more… like their fish tacos or something even more substantial. Jesse’s doesn’t skimp on flavor; the prices and portions are generous and the wait staff is always friendly. This is a neighborhood gem and I am happy to have found it. It’s with their consistency and quality that I write that they are worth a stop if you are itching for a spicy starter or just in town to catch a show at the Shrine. 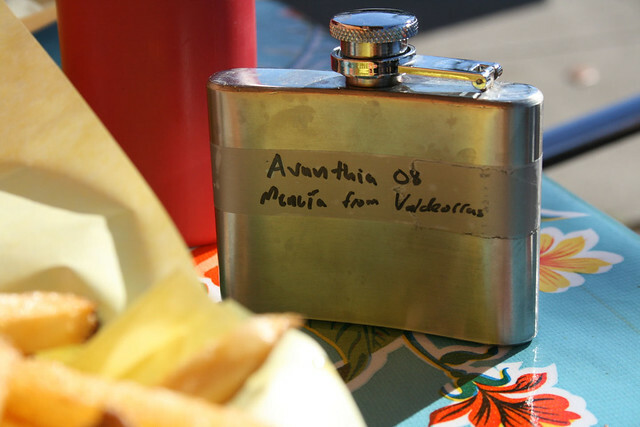 Not the same as a trip to Baja, California, but indelible all the same. In the midst of discarded Christmas trees and drained Champagne bottles, re-activating the long-neglected Maverick Palate was a pressing resolution. In the streets of San Francisco, drawing inspiration from culinary tastemakers and superb bottle shops and out among the Sonoma vineyards I was feeling the comeback. I had lots of great wine in 2013 after I left you, my fantastic subscribers, in the lurch. There was so much I wanted to write about but after picking up a few more wine gigs (read juggling three jobs), the rest of the year flew past in a torrent. By the time I half-typed about a bottle of Field Recordings Chenin Blanc in early October it was time to saber that bottle of 2006 José Dhondt Champagne on NYE! I am not sure what will come of 2014, with travel plans and wine adventures on the books; I don’t want to make promises this early, but, what I’m certain of is that my latest trip to Sonoma County, specifically at Copain, was a resounding success. Not only did I receive excellent customer service while visiting the property in Healdsburg, I was very much impressed by a graceful Syrah from Baker Ranch. 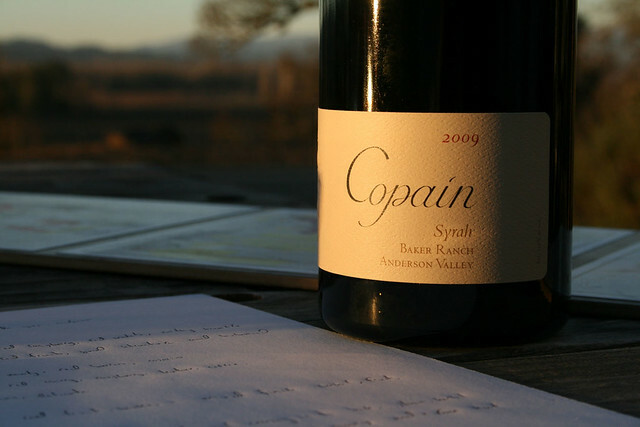 Baker Ranch—a single vineyard release from Copain in 2009—is a personal and individualized expression, rather than the ensemble cast of Les Voisins (the neighbors), which is to say, a cast of single-vineyards’ fruit blended together. Baker Ranch is in Anderson Valley, growing Syrah and Pinot Noir in a cool and a high elevation site. Apart from the other single vineyards that were shown, like Halcon, this wine was confident and extraverted. Pronounced aromatics like violets and sweet spice notes tap-danced above red berries, pencil shavings and beef jerky. 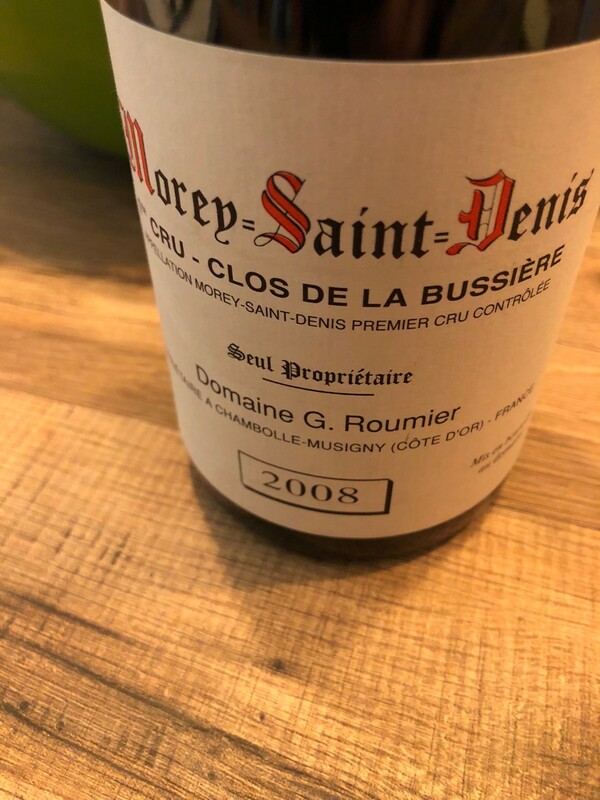 The Syrah was equally impressive on the palate with a fine and prevalent grip (med-plus, ripe tannins), cut medium figure, toned by medium-plus acidity and deep intensity of flavors that left a long lingering impression. Baker Ranch Syrah was in a great place, distancing itself from its parts in Les Voisins Syrah, but without losing focus or sacrificing balance. There were a lot of good food and wine memories forged on my Northern California (San Francisco) expedition, especially that Syrah, enough to make my drive back to Los Angeles a little less exhausting. On that five-hour drive I also thought about how I had missed an opportunity last year to share some killer wines and superb meals worth checking out. I am hopeful that this year will be different, perhaps my vacation has me talking brave, but I am determined to learn from the past and propel this site to new levels. Only time will tell. 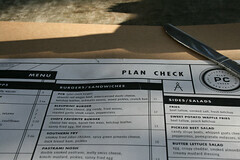 A friend’s belated birthday dinner was the perfect excuse to indulge, and, on advance reservations, we headed west for an early supper at Rustic Canyon to corroborate all the weighty claims about a superior burger served at the Santa Monica eatery. We arrived at 6 PM sharp—parking nearby was easy despite competing with fellow early birds—to a table for two. The dining room was half-full and sun-soaked, poised to catch the most of the waning light as it washed over the worn hardwood floors. A beverage list towered vertically, while our cardstock menus lay glued to the table. 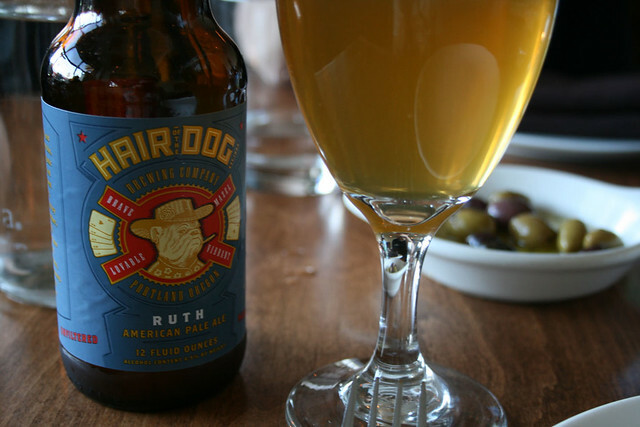 There was little milling over the drinks, we skirted the vin in favor of beer—the list was chock-full of interesting choices—the Rustics, were in fact, a wine bar. The burgers’ reputation was sterling and the reason (one of them, anyway) for our trip, but the starters were where we welcomed our server’s input. 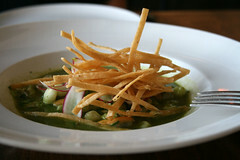 Guided gently to a Clam & Mussel Pozole and the ever-popular Kale Salad to precede the heavier main fare. I nibbled on some olives, passing time with playoff hockey chat. Two diametrically opposed dishes landed together, sharing only their earthy green hue. The bowl of Pozole finished with crisp tortillas, making use of a wide range of flavors and engaging all the senses. From the varied textures to the subtle spice and clean cilantro flavors, the starter had it all in spades. It unfortunately overshadowed the kale salad. Then the burgers landed. All business. Identical presentation between the two plates as the immense cheeseburgers split their rectangular ceramics with fries. The brioche bun was toasted to a firm and flaky consistency to keep its integrity under the rich and fatty grind that was cooked to a perfect medium-rare (a good default setting). 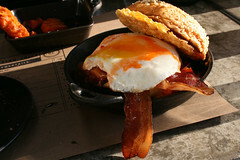 The sharp cheese, melted nicely, lent another layer of fatty flavor, which added continuity to the sandwich’s theme. The spread, pickles and sweet onions worked harmoniously to provide an extra bit of lift. It was simple and satisfying. If a burger’s purpose were to showcase the high quality meat that makes it into the patty then Rustic Canyon would surely get a gold medal. The patty was tender, filling and delicious and they didn’t hide it. We not only disagreed who would make it out of the first round between Anaheim and Detroit but also on how good that burger was (by me it took top honors for E.O.M. in May), as it didn’t bowl my friend over. I guess that’s what happens when one’s expectations are parked above the Hollywood sign. Still, the overall dining experience was excellent and I can’t wait to go back for seconds on the Pozole. With resolutions still fresh, going back to last year seems an odd but appropriate place to start. I had been recommended the Shaka Shack by a colleague and was finally making good on a promise made months ago. Toting a few pours worth of 2008 Bodegas Avanthia Mencia, crossing my fingers for a good pairing, while seriously hoping I wouldn’t have any misadventures, I slated a time that worked for a friend and me to share the offerings of my flask over cheeseburgers for lunch. 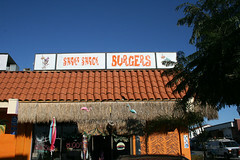 On the corner of Ocean Park Blvd and 17th Street in Santa Monica sits the little burger purveyor, dressed in tiki-attire with everything surf-oriented. Bringing about instant recall, afternoons spent on the shores of the beaches between Brooks and Thalia Streets in Laguna Beach were flooding my mind. Despite the awesome mural and the interesting menu choices, my fill for the ocean themed eatery had been reached in a matter of minutes. I ordered the Shaka Royale combination with my counterpart following suit, waiting outside to allow myself some time to refresh. A ten-minute wait yielded two identical combinations that were less than photogenic. Despite the disheveled appearance the food was actually perfect. A soft bun cradling the 1/3-pound Angus beef patty dressed in a nicely melted layer of cheddar with red onion, lettuce, tomato and secret sauce completing the classic sandwich. The meat was tender and seasoned; the red onion added sharpness and crunch while the other vegetables were a supportive chorus. Fresh and simple. The fries were crisp to the tooth but gave way to soft creamy spud innards. Those may have been the best I’ve had in a while. The wine was a bit of disappointment; the fruit was subdued, showing graphite and woodnotes in its place and a lackluster finish on the highly touted red from the Valdeorras region of Spain. I went back recently, not believing that the photos I had captured would be able to tell the whole story of this deliciously simple burger convincingly, yet on my second go the presentation was fairly consistent. Leaving me to recite the wise (maybe trite) saying: Don’t judge a book by its cover. 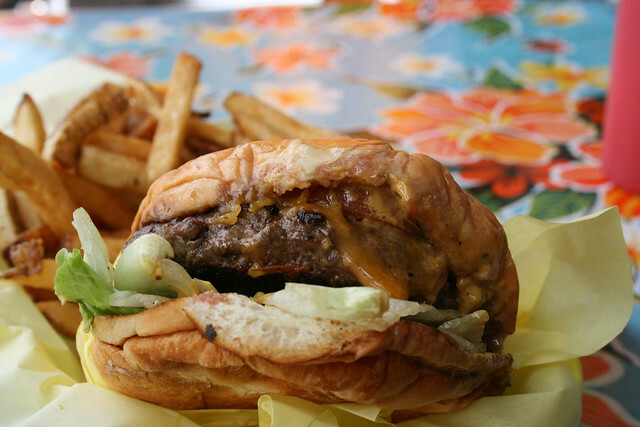 Shaka Shack may not conjure Photoshopped images of griddled burgers and perfectly cooked fries immediately, but a trip there serves up a consistent and well-prepared burger. It’s rewarding to follow your resolutions especially when they are met with great results. 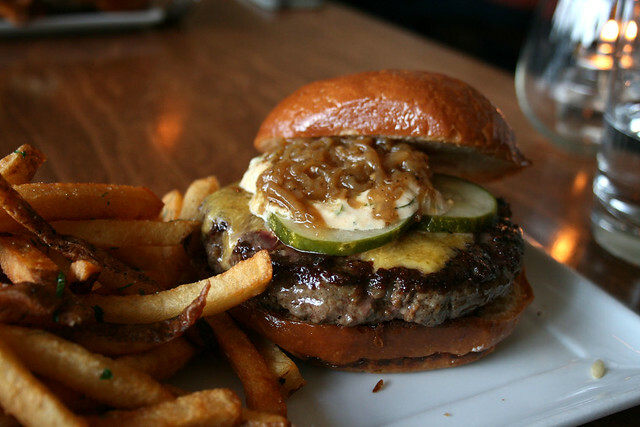 In the Thanksgiving feast preamble, my dear reader,I hope you can sneak in a burger… or at least a review. Over a recent late lunch, I planned to resume the hunt for a quality gourmet burger on the Westside, desperately trying not to think of poultry. My target was the place I should’ve gone instead of Steingarten LA, avoiding one of the worst burger dining experiences I’ve had in recent memory, in favor of a place that had the potential to deliver a burger meriting its asking price. 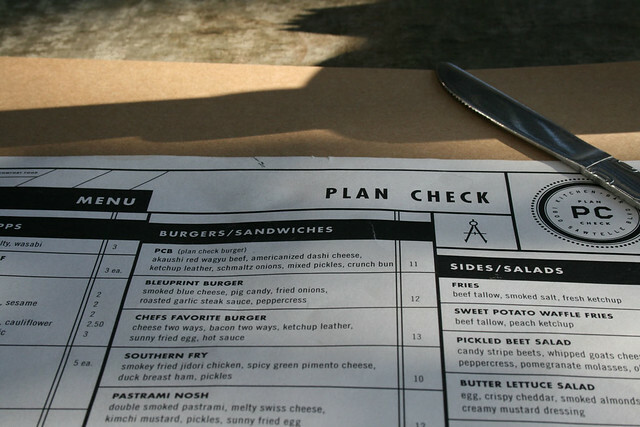 The buzz for Plan Check Kitchen + Bar was audible from blocks away. 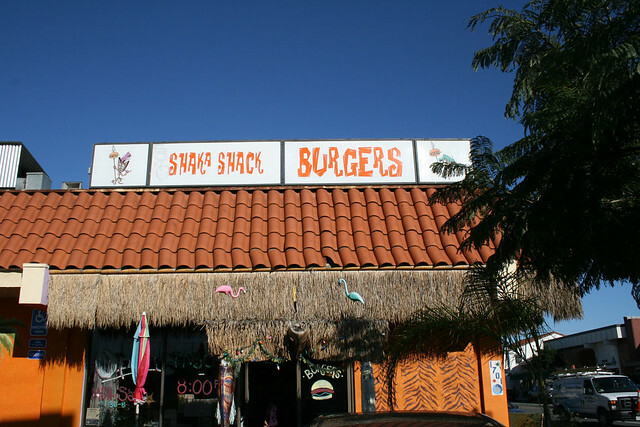 People, random strangers and those I trusted, would often fold Plan Check into the mix of great burger purveyors in the City of Angels. The spot wasn’t new to me; I couldn’t escape the thriving eatery while I was picking up plants at the nearby nurseries or miss the glowing LA Times review from Jonathon Gold a month back. On a corner of Sawtelle Boulevard, sandwiched between Japanese Nurseries and an array of Asian eateries, the contemporary bar and kitchen combo stands apart, pumping out libations while filling bellies with punched-up comfort foods. A friend and I arrived in the late afternoon and passed on dining indoors (trendy communal tables, spacious booths and bar seating) to take root in their great outdoor space, basking in the mid-fall warmth awash Los Angeles. We took a studied glance at the menus—the burgers were a must but the sides are where we ventured into the great unknown. The wine list was devastatingly simple and I elected to go for a draft beer—pining for my flask full of wine. Between the sweet potato waffle fries, hot pastrami fries (a special), and two “Chef’s favorite burgers, we were as good as gold. The sides arrived first. Overflowing from their cast-iron trays, the sweet potato waffle-cuts were glowing and when mixed with the peach ketchup it was uncomfortably close to becoming a desert… nicely done, but cloying. The pastrami fries were covered in melted Swiss, copious pieces of pastrami and topped with diced pickles. The best version of smothered French fries I have had to date. We ate a little to save room for the entrees. 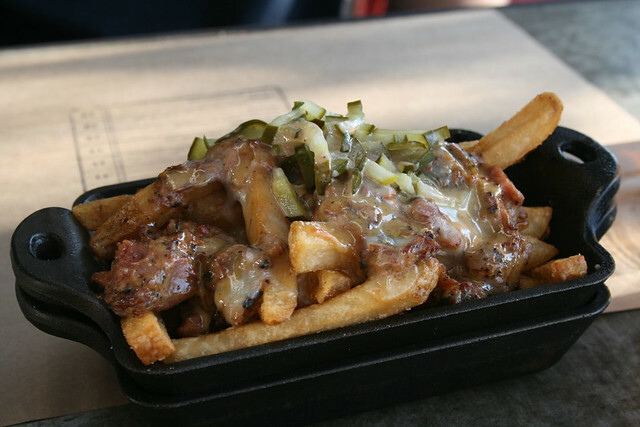 Creativity sets Plan Check’s burger apart from its competitors, with innovative additions like ketchup leather, and serving bacon and cheese in two ways (a gooey mess and a cheese crisp). Those additions add depth of flavor and provide some much needed contrast in texture to this incredibly tender burger. The first bite broke the yolk; my fingers were mired in a messy yellow and red (hot sauce), as I tried my best to keep clean. The patty was well executed—cooked to a medium rare—and the ketchup leather added a nice complement of sweet to the already savory and lightly spiced cheeseburger. Two strips of bacon added to that savory smack. If anything the burger was too much. I felt weighed down and in need of shower afterwards. It was an intense and delicious experience, but too rich for me. At its best, Plan Check combined a lot of my favorite elements like serving the sides first (a la 25˚), a fried egg like some of those standout burgers in Compton, and wielding a soft grind like the delightful 5 Star burger in New Mexico. Not on the shortlist for best burgers of Los Angeles but a close outlier that is worth the price and a niffty destination if you are on the Westside. I knew relatively little about Umbria before I hatched my wine enrichment plan. Other than its geography, placing the region squarely in the center like a buckle around the boot, the fact that it included the much-prized white wine producing city of Orvieto, and the principal red grapes being Sangiovese and Sagrantino among other international vines…there was still a fair amount to learn. Fearing that I would not be able to find enough wines from Umbria to make it through the month, I decided to expand my search, including red wines of central Italy—Lazio and Marche too. What better way to learn about central Italy than pairing the wines with foods hailing from the same regions? This is my firsthand account of central Italian red wines via Los Angeles wine shops and local farmers markets. Delving into my wine books, memorizing the short passages about Umbria, it looked to be overshadowed by Tuscany. I traced out some short notes about Montefalco and Orvieto, cementing my knowledge about the DOC and DOCGs. Trebbiano, or Procanico (the local name for the Trebbiano grape), dominates the white wine production in this scenic and historic region. Truffles constitute a huge part of the food scene, but as a wine buyer, and not an importer, I would most likely leave that off the menu I had planned for uncovering some of the great Umbrian wines. 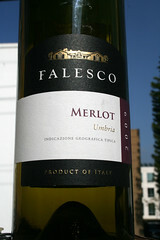 My first glimpse into Umbria this year would be through a seven-fifty of 2009 Falesco Merlot. Falesco, as I found out, was made famous by a brother-team of oenologists (Riccardo and Renzo Cotarella) that have done a lot for the recent revival in winemaking in Umbria. I had friends over and counted on this wine to be an easy introduction to a less common region of Italy, pairing it with appetizers. The bottle received a glowing review from the Wine Advocate, stamping my thirteen-dollar purchase with a 92 point score that made me confident in my selection. I uncorked the bottle of 2009 Merlot for the arrivals, honing my newly acquired sommelier skills. The Merlot released an earth-based fragrance, loaded with spices, minerals and darker fruits that had me sniffing eagerly to extract all the nuances from the complicated nose. The wine was clean on the palate but fairly simple. Its flavors of berries and plums barely lasted on the taste buds leaving behind impressive structural components—awkward. The body of the wine bred in the partly volcanic and sedimentary soils was medium and the acidity was slightly higher (medium plus). The wine was balanced but disappointing, considering the score and the finish. It blared loudly in the beginning only to be bested by its disappearing act in the finish. The Falesco Merlot might have done better if paired with heartier foods rather than the spicier salami (calabrese) and olives but that remains to be seen. In the course of the evening we drank through three bottles of wine, with the Falesco Merlot ranking last for me. Despite the less-than-stupendous showing I still remain positive about the prospects of Umbria. The land of St. Francis (as in St. Francis of Assisi) will undoubtedly show better, especially when paired with some ragù d’agnello (lamb ragù) or anatra muta a porchetta (stuffed roast duck). We are only going up from here.